Significant improvements in search result availability. Faster Bitsnoop, Extratorrent and KAT individual file search results. Reduced use of DHT network for search. Faster torrent download start time. Fixes download error on some Archive.org search results. Misc fixes in Library functionality. 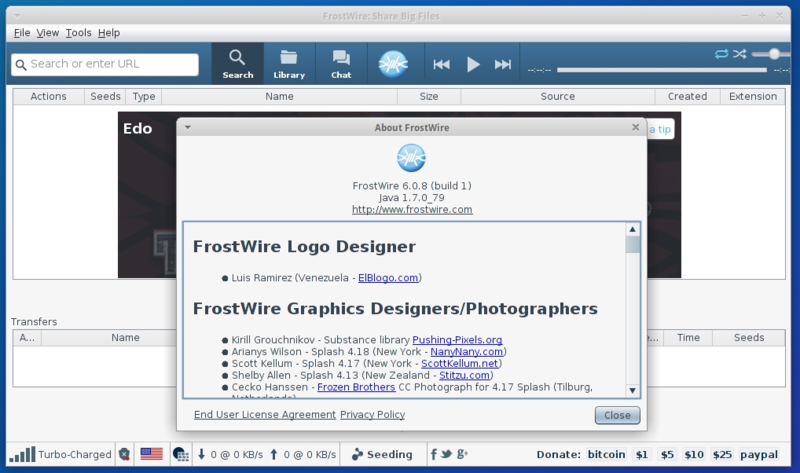 In this article I will show you how to install FrostWire 6.0.8 on 64 bit (amd64/x86_64) Ubuntu, Linux Mint, Pinguy OS, LXLE, Elementary OS, Peppermint, Linux Lite, Deepin, Debian, Kwheezy, Fedora, CentOS, OpenSUSE, Mageia and OpenMandriva systems.